The Episode starts with Nani telling Soumya that she came to take her and tells that the villagers asked her to take her from there before 5 am, else they will come inside. Harman tells Nani that he will take care of her. Harak Singh asks Nani if she didn’t see the crowd and says this baby is of the family, and will not go anywhere. Harman says nobody can touch Soumya. Preeto says we have to search some way. Harak Singh says I have an idea and shares his idea with them. Sukha thinks just more hours, then they will get inside Harak singh’s house. He says nobody shall sleep. Saya asks Maninder to understand and says they have to think about their safety. She asks them to come to stay in her house, and says they will protect them. Maninder and Bebe refuses to come to stay in their house. Maninder says he will die, but will not stay in kinnars’ house. Varun asks everyone to get ready for attack, as there is just one hour for 5 am, and then they will attack. Nani gets worried for Soumya and says just 1 hour is left. Preeto says nothing will happen to Soumya. Harak Singh says until he is here, nothing can happen to his family. Harman takes baby from Soumya and asks her to drink milk first. Soumya says Soham. Harman says Soham is in his father’s lap and asks her to drink milk and then make Soham quiet. Soumya finishes milk. Harman records Soham’s voice. Soumya asks what are you doing? Harman says I will make him hear his cry when he grows up. Soumya asks how did you do this? Harman says he wants to relieve the tension. Raavi brings milk and gives to Soumya. Soumya makes Soham drink. Preeto asks do you think that anything can happen to Soumya here and says we will give our life, but will not let anything happen to Soumya. Nani tells Soumya that if Nimmo have been alive then she would have been very happy to see your family. She says your all members are standing by you today and blesses her and others. Preeto asks Soumya to pack the necessary things and says she will feed milk to Soham. All family members get together. Soumya hugs Preeto. 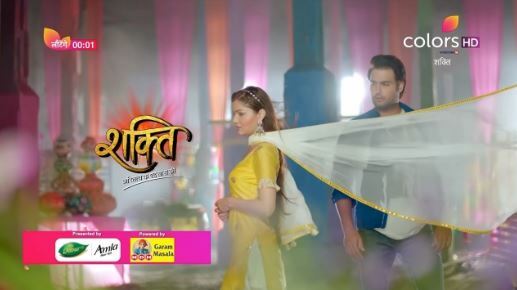 Nasiba song plays…..Sarpanch shouts that they waited all night thinking Nani will take kinnar out and says if anything happens, then..Harak Singh asks Harman to hurry up and says we have to reach bus stand. Harman keeps the baby crying recording there. Harak Singh asks Harman and Soumya to go. Harman and Soumya ask them to come with them. Harak Singh says we will handle them. Sukha says there is nobody in the house and asks them to break the house. Sarpanch, Sukha, Varun and others break the door and get inside. They call Harak Singh. Sarpanch asks Harak Singh to have shame and says you have broken our patience, respect and prestige and asks them to kick out kinnar. Preeto asks him to talk with respect and says she is our bahu. Sarpanch says if kinnar is someone’s daughter, bahu etc. Harak Singh shouts at him. Sukha says we shall search the kinnar. Varun, Sweety, Sukha and others search for Soumya and Soham in the house. Varun sees someone running wearing Soumya’s clothes and asks them to catch them. He says she is running with my baby. The woman with her face covered runs. Varun, Gurmeet and others follow her. Varun and others throw stone on her and makes her heavily injured. The woman in veil falls down. Sarpanch says if anyone tries to make kinnar as family then this will happen. Sukha says who are born to clap, bless people’s children, try to become a mum then this will happen to her. Sarpanch asks Varun to take his son. Varun says we shall make sure that kinnar died. He removes the veil and sees Nani’s face. Nani is severly injured on her head and is critical. Soumya tells Harman that something wrong is happening. Harman asks her not to worry and come. Harak Singh, his family members come there and see Nani writhing in pain. Everyone is shocked. Nani closes her eyes. Precap: Harman and Soumya are attacked by the villagers. Harman fights with them. HArak Singh and his family come there and fight with them. The post Shakti 11th March 2019 Written Episode Update: Nani sacrifices her life to protect Soumya appeared first on Telly Updates.